Eleven years ago on Assumption Day, the most exuberant episcopal ordination American Catholicism has seen in modern times took place in St Louis as a crowd of 2,700 – including, so it was said, "seminarians hanging from balconies" – thronged the city's Cathedral-Basilica to watch a certain wildly beloved former rector of the Pontifical North American College become his hometown's auxiliary bishop. The hubbub of that afternoon could rightfully be called "Dolan-sized" – after all, it was his ordination. And today, deep in the big heart of East Texas' "little diocese that could" – 33 counties, home to 86,000 Catholics and barely a quarter-century old – odds are it will have met its match. For anyone who could use a hearty shot of an ecstatic church at its witnessing, worshipping best – and, really, who couldn't these days? – do yourself a favor and click into the livestreams at either CatholicTV or EWTN (iOS feed) at 2pm Central today (3 Eastern, 9 Rome, 7am tomorrow in Sydney, 2000GMT for the rest) to watch the church of Tyler go over the moon as its own "Father Joe" Strickland is ordained its fourth bishop. Of course, there's a not-so-local element too: with the liturgy, the hometown vicar-general/high-school chaplain (who served for 15 years as rector of what'll now be his cathedral) formally becomes global Catholicism's first blogging priest to take the reins as a diocesan bishop. On the 53 year-old's appointment in late September, every effort was made to nab "the biggest place we could find," and officials thought the city's 2,000-seat Caldwell Auditorium would do the trick. But in just the latest testimony to what's been termed the "intense loyalty" the natives feel toward the bishop-elect – and, from experience, even that's putting it mildly – even the amphitheater would come to require ticket-only admission given the crush of locals who sought to attend; a drawing was held to allot the available spots. A reception open to the general public will follow the Mass in the city's convention center. 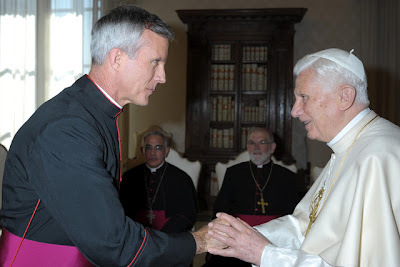 SVILUPPO: As memorable as expected, fullvideo of Strickland's ordination remarks has been posted.